Above, you will find a list of the most popular destinations for ESL teachers, with information about salary, requirements, and the ESL industry in that country. Coventry House International and Ontesol offer the most complete and honest job assistance service. List of schools in top destinations (See country profiles above), TESOL websites, and recruitment agencies. Access more than 10,000 monthly positions worldwide! Job board. Access your student account and get the scoop on the best positions worldwide! Recruitment service for EPIK, South Korea. 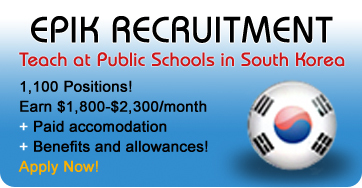 Teach English at public schools in South Korea! Research assistance. Contact us and we’ll assemble more resources for you! TESOL Expert program. Visit our blog and learn more about job hunting, types of schools, employment contracts, visa requirements, cultural advice, and more! Some institutes go as far as guaranteeing that they will place you in a school upon graduation. Others offer a money-back guarantee if you can produce a certain number of rejection letters. The truth is that ESL schools just throw unsuccessful applications to the bin and never send these letters. Accrediting organizations such as TESL Canada, ACTDEC UK, Trinity CertTESOL, and CELTA do more than just raise the standards of TESOL/TEFL courses. They also prohibit member schools from engaging in misleading advertising. The best way to increase your chances of getting a good job is to take a quality TESOL course. If the institute does not offer an extensive job assistance service, you can use the services of a reputable recruitment agency that specializes in this area. Some TESOL / TEFL institutes charge over $1,000 for a job placement service that costs more than the courses they offer. Furthermore, research shows that the positions being offered pay half the minimum wage in that country because only cram schools and summer camps accept their credentials. Never pay for job placement assistance! On a monthly basis, there are over 10,000 jobs being posted worldwide and hundreds of recruitment agencies are waiting to help you free of charge. Reputable agencies do not charge teachers for their service because schools pay them to find qualified teachers for them.